Featured a few times previously on Botany Photo of the Day (including here and here), I thought I’d share another take on this (to me) iconic tree. Ponderosa pine or yellow pine is native to western North America, stretching from British Columbia south to central Mexico. The band of green leaves in the foreground is from Arctostaphylos patula, or greenleaf manzanita. Gorgeous photo! I love the dark, vertical fissures in the bark. They look like they are moving in the fog…. Given that its entire family is named after ME!, I am, of course, more interested in the manzanita. 🙂 It is a lovely photo (and I’m adding it to my wallpaper). 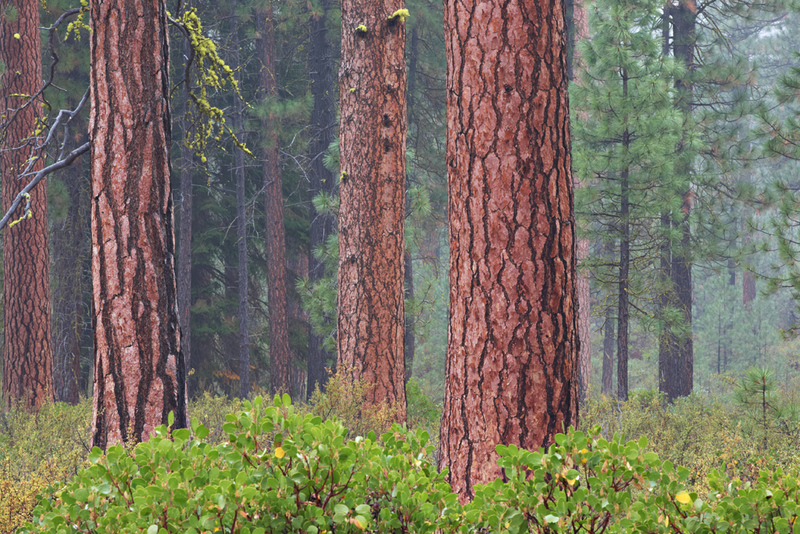 Ponderosa pines in the SW at 7000′ here in Flagstaff,AZ have the same majestic beauty as the trees pictured. However, the climate (much drier), the understory (much more open, less shrubby, and more grasses), and the surrounding landscape (volcanic) provide a different context. Please come explore this part of the range. Three lines was all he writ, but what a feast. I loved the links to the previous postings. Here in the Willamette Valley in Oregon, Ponderosa Pine can be found in inundated soils associated with Oregon Ash (Fraxinus latifolia) and Slough sedge (Carex obnupta). It can also be found in Oak Savanna communities with Oregon white oak (Quercus garryana). When we sourcing plant material for our restoration projects, we need to specify the seed source as occuring in the Willamette Valley and not the Cascades. Everyone should hug a ponderosa and smell the vanilla or butterscotch (to some) aroma of the bark on a mature tree. It appears pretty much all planted specimens of any size in the Seattle area now (recent years) have a foliage browning, often tending to be more severe on one side of the tree than the other. I have also seen this condition on Coulter pines here – but not on Jeffrey pines.